Misericordia University has helped students and parents afford a superior college education. Through its participation in federal and state financial aid programs, use of institutional resources and contributions by alumni and friends, the Student Financial Services Office tries to meet, as fully as possible, each student's financial need. The University is eligible to participate in a full range of financial aid programs through the U. S. Department of Education. University scholarship and grant programs can make a difference in your "bottom line" cost depending on family income and other factors, Federal, State, and University grant programs can have a significant impact on the amount you actually pay for a quality Misericordia education. 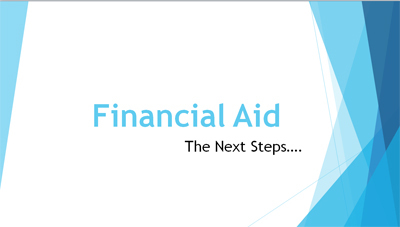 Download the 2019 Admitted Students Day presentation "Financial Aid, The Next Steps"
The Sister Mary Glennon '62 Full-Tuition Scholarship - Eligible students (1250 SAT [or ACT equivalent] and 3.7 GPA, or 1250 SAT [or ACT equivalent] and top 5% of class) will take part in an essay writing competition (held on several days in late January/early February), and the top scoring students will return to campus in late February for an interview with committee members. Merit Scholarship - To demonstrate its commitment to academic excellence, the University awards financial assistance to incoming freshmen who have attained outstanding academic records. The annual scholarships are renewable until graduation, provided minimum grade point averages and satisfactory academic progress are maintained. The minimum averages required for retention of the award are outlined in the scholarship notification letter. Annual award amounts range from $5,000 to $20,000. Students are automatically given scholarship consideration at time of admission. McAuley Award - Students with records of leadership, volunteerism and participation in extracurricular activities may qualify for annual awards ranging from $1,000 to $3,000. Eligibility for the McAuley Award will be determined based on the information provided on the application for admission. Legacy Award - Incoming full-time freshmen who are the children or grandchildren of Misericordia University alumni will receive a $1,000 annual award. Sibling Grant - A sibling discount of $1,000 per year is available when 2 or more eligible siblings are concurrently enrolled at the institution. Award is given to the eldest sibling. Non Pennsylvania Resident Grant - Out of state students who demonstrate significant financial need and reside on campus will be reviewed for the non-Pennsylvania resident grant. This annual award is renewable provided on-campus residency and satisfactory academic progress are maintained. Eligibility is determined by filing the FAFSA annually. Mission Grant - Through its own fund raising effort, Misericordia University provides substantial financial assistance to needy students through Mission Awards. These awards help over 65 percent of Misericordia students meet their University costs. These awards are available to undergraduate full-time students with demonstrated financial need. Awards range yearly depending on need, available funds and other aid received by the student. Students who receive the Mission Award must maintain satisfactory academic progress and file the FAFSA form each year. Eligibility for this award must be determined each year. Supplemental Educational Opportunity Grant - This federal program is available to undergraduate students with demonstrated financial need. Awards range from $400 to $500 yearly depending on need, available funds and other aid received by the student. Eligibility for these funds is automatically evaluated for all students who complete the FAFSA. Pennsylvania Higher Education Assistance Agency Grant (PHEAA) - This program allows PA residents to obtain financial assistance for undergraduate study. Eligibility and grant amounts are determined by PHEAA. Students apply directly for this grant by completing a FAFSA. The deadline for application is May 1 prior to the start of the academic year for which the aid is requested. PHEAA notifies students of their grant eligibility by email after which the student must go to www.pheaa.org and respond to the PHEAA state grant inquiry. For assistance call 1-800-692-7392. Other State Grants - Some states provide grants to their residents which can be used at colleges in other states including PA. These include Ohio, Rhode Island, Connecticut, Massachusetts, West Virginia, Delaware, Washington D.C., and Vermont. Prospective students should contact their high school guidance office or their state higher education office to learn more about their state programs and to obtain applications. Teacher Education Assistance for College and Higher Education (TEACH) Grant - The TEACH Grant is a program designed for education majors enrolled in the high need fields of special education, mathematics, biology, chemistry and English as a second language. Incoming freshman applicants must have achieved a 3.25 high school grade point average. Current students must maintain a 3.25 grade point average. A TEACH Grant recipient must serve as a full-time teacher in a low-income school for at least four academic years within eight years after completing the course of study. Otherwise, the grant will convert to a Direct Unsubsidized Stafford Loan that must be repaid. The annual award is $4,000, with aggregates not to exceed $16,000 for undergraduates or $8,000 for graduate students. Federal Workstudy - This federal financial aid program is for eligible undergraduate students with high financial need. Work-study allows student to earn money to cover a portion of educational expenses by working on campus, earning minimum wage. EARNINGS ARE PAID DIRECTLY TO STUDENTS, NOT CREDITED TOWARD PAYING THE SEMESTER BILL. Part-time Jobs - Some part-time employment is available in the community for students. Students who are interested in part-time employment opportunities should inquire at the Insalaco Center for Career Development. Transfer Agreements - Misericordia University has a formal transfer agreement with Luzerne County Community College, Lackawanna College and Keystone College and offers a special grant to full-time students transferring from these institutions. The grant is $1,000 per academic year. Pennsylvania Association for College Admission Counseling (PACAC) Scholarship Opportunity - The PACAC scholarship is for high school seniors graduating from a PACAC member high school in the Commonwealth of Pennsylvania. The top recipient will receive a $1,500 scholarship and the other three will receive a $1,000 scholarship. High school seniors should also contact their school guidance counselors for local scholarship information. Please contact the Misericordia University Admissions Office at 1-866-262-6363 for additional information and criteria. In addition to University scholarships, monies may be available from sources outside the University such as corporations, foundations, and civic organizations. Please note that the maximum award for any combination of scholarships and grants is the annual full-time undergraduate tuition. Gift aid cannot be applied towards room and board charges. To View Loan Options available please click here. Click here to view Payment options available.